Many people think of landscape lighting as a nice feature for homes and residential properties. However, good outdoor lighting design is critical for businesses, as well. In today’s society, people are out and about late into the night, and all of that is made possible by light. If your business is not making use of good landscape lighting, you’re losing out. Your customers expect and deserve a quality experience when they visit your business, day or night. If your business is lacking adequate lighting, your customers are not having that experience, and it’s costing you money. If you’re not sure where to start, don’t worry. Night Vision Outdoor Lighting has the perfect guide to how outdoor lighting can improve your business. There are no second chances at a first impression. The entrance to your business is the first thing that your customers will see. It’s where they will make their first impression and decide how they feel about your business. A dark entrance can make your customers feel uneasy. It may give them the impression that your business is run down, or poorly maintained. It can even give the impression that your business is dangerous. If your business is in an area with other, better-lit businesses, potential customers may just assume you’re closed. None of these things is the impression you want your customers to have. Highlighting the entrance to your business should be more than just pointing a floodlight or two at your door. Good lighting can be an advertisement for your business. 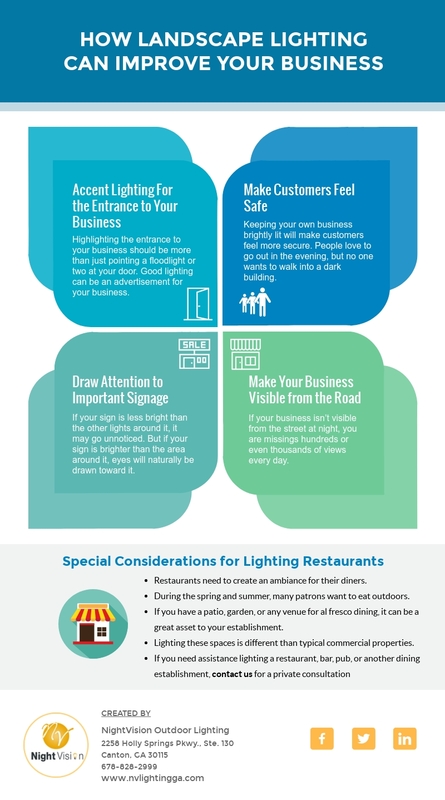 In many ways, lighting a business is not unlike lighting a home. The front (or entry side) of your business is like a blank canvas. You want to fill that canvas with a background, a midground, and a foreground. To start, lay down a background with some soft light over the whole facade of your business. Some wide-angle floodlights are usually perfect for the job. This lets customers see your business and avoids dark patches. Next, use some bullet lights to highlight unique aspects of your building or entryway. If you have pillars, architectural details, or anything else that stands out, light it up. If you have none of that, you can create interest with lights alone. Strategically place uplighting can create texture where there was none. Finally, think about your foreground. Is there a walkway to your entrance? Perhaps you have an awning or some bushes that stand out a bit from your building. Any of these are opportunities to create depth in your lighting design. If you want customers to feel comfortable coming to your business, they will need to feel safe in the area around your business. You may not have complete control of the surrounding area. However, keeping your own business brightly lit will make customers feel more secure. People love to go out in the evening, but no one wants to walk into a dark building. For general security lighting, we suggest downlighting. Installing lights high up, on a building or in trees, is the easiest way to light up a large area. When lighting a home, it often makes sense to go soft on the downlighting. A dim, bluish light can give the impression of natural moonlight, which is calming and romantic in a residential setting. But in a business setting, go for a brighter light. People want to be able to get around easily and need to feel like no one is lurking in the bushes. Sometimes, you have a message you really want people to see. It may be as simple as “OPEN”, or as detailed as a daily specials menu. Whatever it is, the only way people will see it at night is if it is lit up. At night, your customers’ eyes are naturally drawn towards areas of light. So if your sign is less bright than the other lights around it, it may go unnoticed. But if your sign is brighter than the area around it, eyes will naturally be drawn toward it. Depending on the type of sign you have, the lighting you will need varies. If you have a large sign that is high up and meant to be seen from some distance, try direct uplighting or downlighting. That means placing bullet lights at the top or bottom of the sign, standing out a foot or more, and pointing right at the sign. You can think of that as classic billboard lighting. If you have a smaller sign meant to be seen from closer up, you don’t want the lighting to be overwhelming. Sandwich board signs should be easy to read when you stand in front of them. Too much light would be blinding. A small downlight is fine. Alternatively, you could place it in an area that gets some ambient light from your general area lighting. Another fun option is to decorate small signs with rope lights. They provide a surprising amount of light without a lot of glare, and they can be wrapped around the edges of a sign. Sometimes, a customer needs to see your business a hundred times before they finally stop and come in. If your business is on a busy street, you have the opportunity to hit the eyeballs of potentially thousands of drivers every day. But if your business isn’t visible from the street at night, you are missings hundreds or even thousands of views every day. So what is the best way to make your business visible from the road? 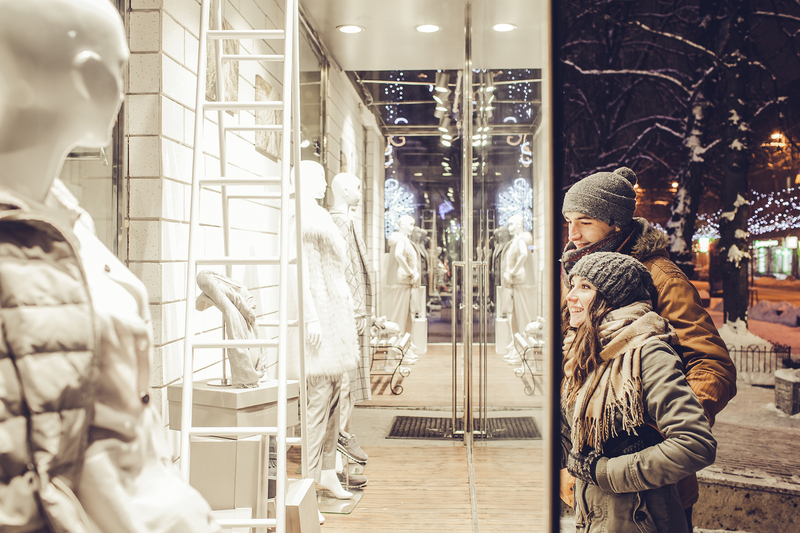 The first tip to consider is that you want to avoid lighting up your business like it’s Christmas all year round. Unless you are running a resort on the Vegas strip, there is such a thing as too much light. Instead, consider what impression you want drives to have as they pass your business. If you have good accent lighting for your entrance, as we’ve discussed above, you have already done a large part of the work. In addition to accent lighting for your entrance, think about how you want your space to appear to a passing driver. Are you sleek and modern, classic and stately, or quaint and cozy? Your lighting design should be a part of your marketing message. Of course, most businesses get some outside help with marketing, or they have a department dedicated to the task. So we don’t expect you to know exactly how to express the core of your business in lighting. Night Vision Outdoor Lighting understands the importance of lighting for commercial properties, and we have completed thousands of projects, both commercial and residential. So we have a great deal of experience to draw on. We’ll meet you at your place of business and discuss your needs. Together we can design the perfect lighting to catch the eyes of all those passing drivers. Lighting restaurants in a little different. In addition to everything we have already said, restaurants need to create an ambiance for their diners. During the spring and summer, many patrons want to eat outdoors. If you have a patio, garden, or any venue for al fresco dining, it can be a great asset to your establishment. Lighting these spaces is different than typical commercial properties, and we’ve talked about it in other blog posts. If you need to light a restaurant, bar, pub, or another dining establishment, contact us for a private consultation. We’ll examine your space and open a discussion about the best ways to use your outdoor dining area to create a fun and memorable experience for your guests.